This spectacular Lakefront Vacation Home is located at the base of the Blue Ridge Mountains, in the mountains of South Carolina. We are in Tamassee -with Lake Jocassee and Keowee to the east, Walhalla and the Chattooga River just west, and Highlands and Cashiers just to the north. Relaxing at a great lakefront retreat, enjoying Clemson Tiger football, and hiking, white-water rafting, and exploring, are all convenient and nearby. 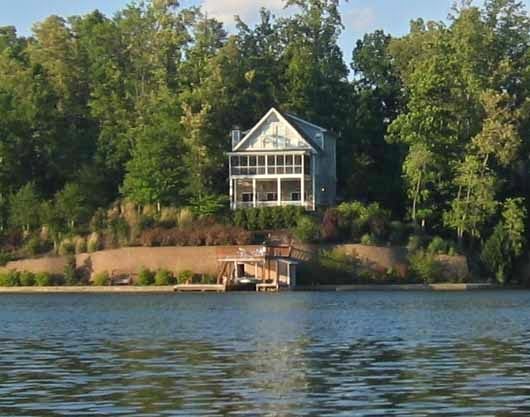 This top shelf home is located on a beautiful, private, 160+-acre, boatable lake with a large private dock, swimming area, and a nice view of the South Carolina Blue Ridge Mountains. The home has Direct TV and Good Wifi. With the internet, it is easy to find out where things while you are there. This is a great family vacation rental home for both the active group and the 'kickback and relax' family. The home is very fully equipped and is very upscale, yet casual. We are on Lake Cherokee, a true hidden gem, but there is not much published on this lake. Email us for more information. The master on the main level has King Bed, en suite, with garden jetted tub and walkin shower, plus double sinks. The upper level has 2 bedrooms each with queen bed, and share a bath that is accessible directly from one bedroom and accessed from the hallway by the other bedroom. There is an extra half bath on the main level for general use without going to the bedroom. On the lower level is a full bath with walking shower. There is a very nice queen poster bed and a twin trundle set. The the trundle pops up and can be made with the other twin bed into a modified king bed, or used as 2 twin beds. The ground level is one large room, but because it is very private with a separate area near the full bath, we have listed the house as 4 bedrooms. This ground level also has the game room with ping pong table/pool table and seating area with TV, but nicely separated from the sleeping area, as this is a very large room. This property is very centrally located to all the wonderful natural attractions of Oconee County, as well as the Chattooga River area, and a short drive to Cashiers, Highlands, Gorges State Park, and other wonderful local attractions. Lake Cherokee is one of many private lakes in Oconee County and it is the largest. We are a private lake and the lake is motorboated, but only owner motorboats are allowed, so it is always peaceful. We allow our guests use of our kayak and canoe. Great fishing. We also have a very nice swimming area off of our large boat dock with easy walkin steps to the water, great for children and grownups alike. Nice and shallow near the shoreline, water all-the-time, unlike the large reservoir lakes, and the water goes nicely deep just off the end of our dock. toilet, shower, jetted tub, Main level. Very large. Walkin shower& a jetted tub-2 sinks. toilet, shower, Ground level full bath. toilet, Sink and Toilet on main level. Entrance from great room. Great room area. Open floor plan. See photos. Plus bar seating for 4 more. Ping pong and pool table. Private lake. Only owner boats allowed. We have 2 kayaks and canoe our guests can use and go out on the lake. Very large private lake of over 160 acres and 4 miles+ of shoreline. Floats, life jackets, and some water toys. Some fishing equipment. As we are on a private lake, no fishing license required to fish as our guests. Private lake, but you have access as our guests. You cannot put your motorboat on our lake, but we allow guests use of our kayaks and canoe. Very central to the many attractions of the Waterfall, Rivers, lakes region of SC Golden Corner, near Ga and Chattooga river, Highlands, Cashiers, and Brevard. Asheville and Maggie Valley not too far away and could be done on a day trip while staying at our place for a week.